A premium slab of beef, delicately and patiently aged and grilled to perfection, served with nothing more than a drizzle of housemade infused olive oil and a pinch of salt...just the way it should be. 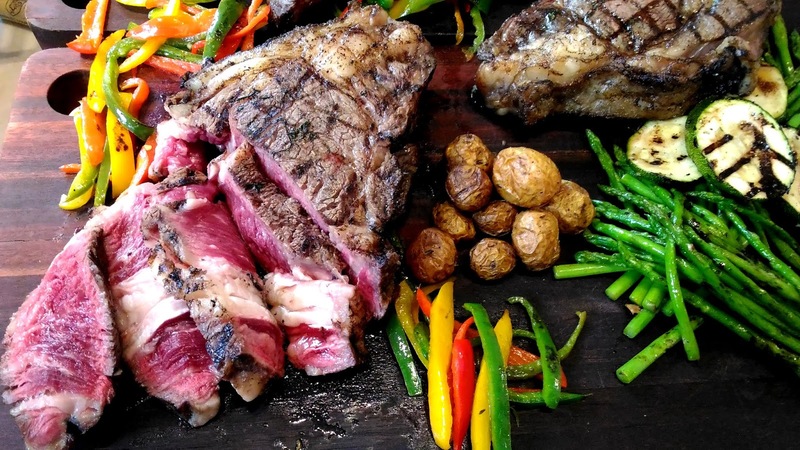 It's all about the beef, and a dining experience that's a cut above...at Atelier Vivanda Manila. A local, homegrown concept shares its innovative take on the burger...and its healthy and irresistibly delicious. Healthy doesn't have to be bland. H.I.D. Burgers offers a flavorful yet alternative option to the usual burger with their flame-grilled chicken patties served on a pan de sal-like bun for a new flavor experience. Matched with affordable pricing, it's a winning combo. And from the city's outskirts where it all began, H.I.D. Burgers expands its market and reach as it enters the heart of the metro's culinary scene. ...and the steaming hot bowls of Annam Noodle Bar's signature Hanoi-Style pho is just perfect when the skies turn grey. And there's nothing like Annam Noodle Bar's Pho Australian Ox-Tail and Beef Balls to make things right on a rainy day. Dee's Gourmet Popcorn: Not Your Usual Popcorn. Cheesy Cheese. Coffee Almond Crunch. Buttery Caramel. Stripes. And Santa Fe Mexican Blend...it's definitely not your usual popcorn. Davao's popular Blue Posts Boiling Crabs and Shrimps comes to Manila at SM North Edsa's The Block, the first of many branches planned for the year. And once the food-grade wax paper is laid across the wooden table, the fun and feasting is about to begin...at Blue Posts Boiling Crabs and Shrimps. Grind Bistro brings its signature burgers and comforting American-style cuisine up north, with Grind Burger at SM North Edsa's The Block. Burgers, hotdogs, and even rice meals, Grind Burger does it right. The ZenBook 3, Transformer 3, and ZenFone 3 finally arrives in the country...it's the power of Z3N. Army Navy Burger + Burrito introduces their new Mextiza Pasta, four new pasta dishes offering both classic and innovative executions guaranteed to satisfy any pasta craving. Craving for an inventive spin, or simply comforting and rustic flavors, Army Navy Burger + Burrito's got one of four pasta dishes just for you with their new Mextiza Pasta. ...and see what others can't see. Since then, taking photos with my ASUS ZenFone2 Laser has been an interesting journey, and quite a liberating and tasty one at that. One snap, and you finally get to realize what so many millennials have known all this time. Maybe you can teach old dogs new tricks, and it's easy with the ASUS ZenFone2 Laser. Even for baby boomers. And it all started at Makati Diamond Residences, with the Weekend Champagne Brunch at Albert (photo taken at Makati Diamond Residences with my ASUS ZenFone2 Laser, or see my earlier post, A Weekend Champagne Brunch at Alfred, and compare it with the photos on the post taken with my trusty DSLR). Limbaga 77 shares its own unique take on Filipino comfort food with inventive dishes inspired by local flavors, just one of many dining options along Scout Limbaga in a quaint neighborhood of Quezon City. Photo of coffee beans from my earlier post, The World's Best in a Cup at Dipdenza Coffee. Raintree Restaurants, the same group behind M Cafe, Kabila, Chelsea Grand Cafe, Chelsea Kitchen, Stella, Rocket Room, Terraz, Simple Lang, Momo Cafe, and Saboten, introduces its newest pair of dining concepts, Izakaya Sensu and Chotto Matte, for a new and refreshing dining experience that's authentically Japanese. And just like M Cafe and Kabila, and Stella and Rocket Room, Izakaya Sensu and Chotto Matte also offers a unique dual dining concept all in one place. Sushi and yakitori at Izakaya Sensu, followed by a round of Kakubin Highballs at Chotto Matte within steps of each other in one place, now how cool is that? Certified Angus Beef Porterhouse, Ribeye, and Tenderloin, fresh off the grill...there's a new steakhouse in town. B Hotel's Johnny's Steak and Grill fires up its premium selection of steaks in Quezon City, adding to the blossoming culinary landscape this side of the metro. IHOP introduces new dishes created specifically for the Philippine market, providing loyal customers and diners even more tasty options in addition to the familiar IHOP classics available throughout the day. And you can even sample the winner of IHOP's International dineChef Contest, a competition participated by IHOP's global network of branches for the creation of exciting and new dishes. Breakfast, lunch, and dinner...it's all here at IHOP. Your favorite Chicken 'N' Mojos at 40% OFF the regular price... It's Monday Madness at Shakey's. When rainy days and Mondays get you down, simply pull out your Shakey's Supercard and enjoy your favorite Chicken 'N' Mojos with an exclusive 40% discount in any Shakey's branch. Rainy days and Mondays made better...at Shakey's. After 71 Years And Counting, Still Sarap to the Bones at Max's Restaurant. Pan de sal, Pan de keso, Bicho-Bicho, Egg Pie and Pineapple Pie...classic treats from a neighborhood bakery. Since 1939, Kamuning Bakery Cafe has been serving these baked treats and more using traditional old-school methods with its pugon, a wood-fired brick oven. Like a trip down memory lane, Kamuning Bakery Cafe stands out with its nostalgic freshly-baked artisanal bread and rustic pies, serving a new generation of loyal customers.